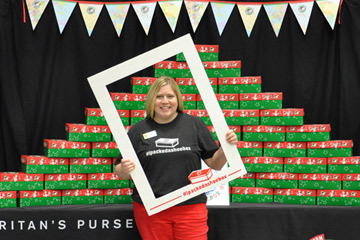 Jill Cobb serves year-round as an area coordinator for Operation Christmas Child. Springfield area resident fulfills dream to reach children for Christ through Operation Christmas Child. Jill Cobb of Mountain View, Missouri, does what she does because she’s focused on Christ’s final words on earth, which begin: “Go and make disciples of all the nations” (Matthew 28:19, NKJV). 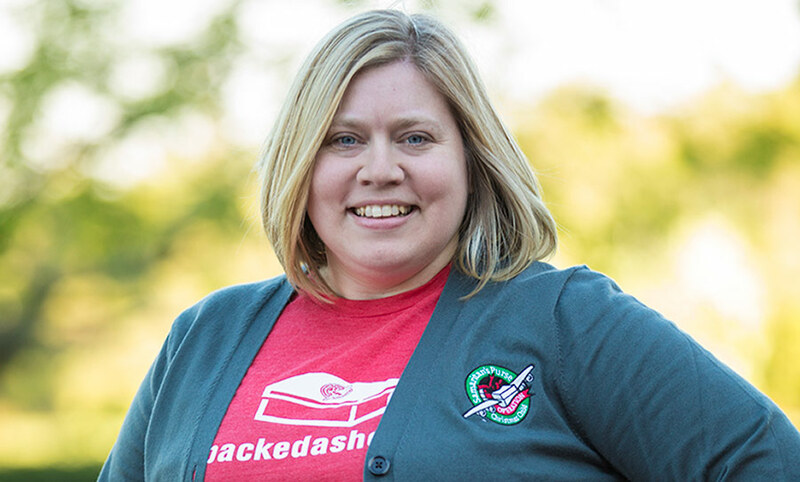 She volunteers as an area coordinator for Operation Christmas Child and consistently mentors her team of 55 people to stay focused on why they serve. The group’s goal is to “mobilize people and multiply shoebox gifts” and their motivation must remain reaching children with the Gospel. Jill wants to filter everything her team does through this priority. “There’s so much to do. It’s easy to focus on details instead of realizing why I’m doing it—for Jesus and the Great Commission,” Jill said. 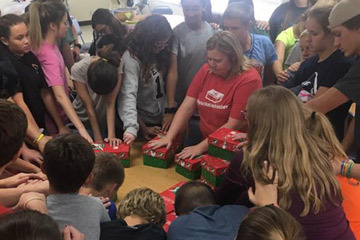 Jill (center, in red) prays with a group of students over the shoebox gifts they packed. This big-picture perspective is impacting the results of their efforts. In 2016, the official shoebox collection goal for the 18 counties in their area was 38,000. “We prayed that we’d be able to describe that year in two words: only God,” Jill said. The Lord then surprised them with a total of 41,359 shoebox gifts! Some churches in their area actually collected twice their goal amount. In 2017 their collection totaled 43,816. The group gives God the glory that each one of these boxes—each of these Gospel opportunities—will bless children, their families, and their communities. Secondarily, she serves in order to model Christ’s heart to her children, ages 10 and 7. Jill wants to teach them to be “on mission” at an early age. “To see their hearts grow for children around the world to come to Jesus has challenged me to go deeper in my faith, too,” Jill said. A former mentor of Jill’s, Winnie Tuckness, serves as a regional area coordinator overseeing three Operation Christmas Child area teams. A few years ago, as Winnie drove US Highway 60 from Springfield to Nashville, Tennessee, she noticed First Baptist Church in Mountain View, Missouri, and thought it would be a good place for a shoebox drop-off location. When she noticed Matt Cobb was the pastor, she wondered if this could be Jill’s husband. She hadn’t had contact with the couple for 10 years. Jill shows her enthusiasm for Operation Christmas Child. Calling the church, she discovered it was in fact the same Matt and Jill Cobb whom she’d known years ago. This led to a reunion with the couple, and Winnie asked Jill if she would be interested in volunteering with Operation Christmas Child. She served in logistics first, and in 2016 became the area coordinator for the Springfield, Missouri Area Team. During her interview for that position, Jill was reminded of a vision she’d had 10 years earlier of 1 billion people being saved during her lifetime. She shed tears of joy when she realized that, through Operation Christmas Child, she could have a small part in this becoming a reality.